I have history degrees from the University of Warwick, which I attended as a “mature student” in the 1990s. From 2002 I worked for Open Studies, becoming a freelance lecturer in 2010. 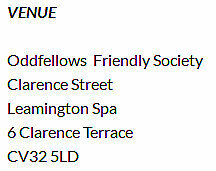 I teach in Leamington, Coventry, and at the Percival Guildhouse adult education centre in Rugby. My training was in early modern English history, but I have ranged more widely since then. King John, 1199-1216; our worst king? Despite inheriting the vast Angevin domains in England and France, John lost most of his lands in continental Europe, was excommunicated by the Pope, signed Magna Carta and, at the end of the reign, was engaged in a civil war – hardly a string of successes! Surprisingly, he has had some defenders. The course will endeavour to evaluate this notorious king. Our class is friendly and informal, and participation is encouraged. No prior knowledge of the period is required. The course runs for 11 weeks and our sessions are as follows. If you wish to enrol for this course, or have any queries, you may contact me by typing your name, e-mail address and message in the boxes below and clicking “submit”. You do not need to enter a website address, but it would be helpful if you would give a phone number together with your message in the Comment box. I will try to answer your message as soon as possible.